Upon stepping into American classic sports utility vehicle brand Jeep, one cannot help but feel the urge to become a little bit more adventurous. 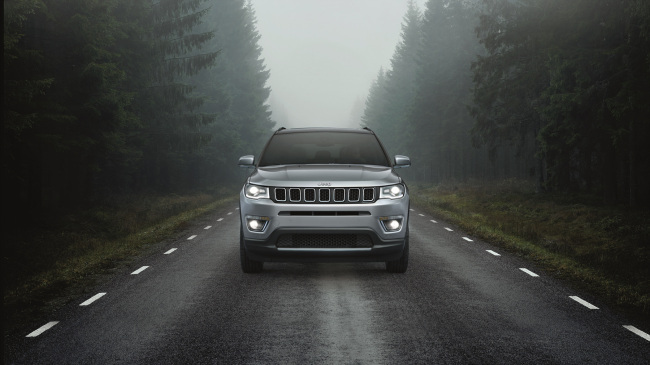 The brand that symbolizes such boldness, however, gets a softer tone with the Jeep Compass, a midsized model in its SUV lineup, especially in its latest version. The All New Jeep Compass that reached the local market in July has gotten an urban touch with modern, young design elements. But it has kept its daredevil spirit inside. The Tighershark MultiAir2 Gasoline Engine produces 175 horsepower, or 23.4 kilogram-meters of torque, which enables drivers to feel the power of the vehicle, stability in driving and dynamic performance. During 1 1/2-hour drive from Yeoksam-dong, southern Seoul to Gapyeong, Gyeonggi Province, the Jeep Compass proved itself as an American vehicle that fits both the urban and adventurous lifestyle. Smooth and dynamic, it sped up quite fast, although not quite like a sports car. In high-speed areas above 140-150 kilometers per hour, it felt a bit sluggish. The most impressive element of the Jeep Compass was the steering, which worked smoothly, enough for a driver of slight build to have full command of the SUV armed with high-strength steel. It also excelled in cornering when climbing up hills and on the descent, highlighting its four-wheel drive. Safety features were also noticeable in offering easier parking with its ParkSense Rear Park Assist System, not to mention Blind Spot Monitoring, though the alert sound could be described as disturbing. Good news for loyal Jeep supporters: The vehicle has added convenient features including automatically folding side mirrors and an 8.4-inch touch screen for the infotainment system including Android Auto and Apple CarPlay. It comes equipped with nine speakers for the Limited with 2.4 Gasoline, offering full surround sound. The fuel efficiency of the SUV, however, was not so satisfactory. On average it drove 7.1 kilometers per liter, and its energy efficiency is certified as Level 5. Prices range from 39.9 million won to 43.4 million won ($35,000-$38,100) for two types: the Longitude 2.4 Gasoline model and Limited 2.4 Gasoline.